With dramatic scenery in spades, miles of heathery moorland and lovely sandy beaches, the Shetland Islands are a fantastic place to take your dog, and there are many fine Shetland dog walks to be had! We asked Sara from the Lerwick Terminal about her dog Dougal’s favourite walks. We hope that you and your dog enjoy visiting these wild and beautiful places! The island of Burra is attached by bridges (and a road through neighbouring island Trondra) to the Shetland Mainland near Scalloway, and to reach Banna Minn beach, follow signs for Papil and then Banna Minn itself. There’s a car park at the top of a hill and then a walk down onto a stunning tombolo. Adventurous explorers and their energetic dogs can cross to the Kettla Ness peninsula. Otters and seals can be spotted here! Please note that the dominant agricultural activity is Shetland has always been sheep rearing, so please, here and on all Shetland walks, keep your dog on a lead when appropriate. You’ll notice signs to Fladdabister on the A970 north of Cunningsburgh; take the road which leads you closer to the coast. There’s a cluster of ruined croft houses and ruined water mills next to the burn and a lovely shingle beach. Above the beach limestone was crushed and burnt in drystone limekilns for agricultural purposes in the 19th century. You and your dog will really enjoy the walk along the Fladdabister; you’ll enjoy spotting sea caves, wild flowers and birds! Meal Beach is one of Shetland’s finest beaches; it’s located on West Burra, 275m below a car park and public toilet. The white sand and turquoise water of Meal Beach is quite lovely! From the beach there’s a coastal path to the nearby fishing village of Hamnavoe. The heart of Hamnavoe is its harbour; see if you can spot a shell covered house and a knitted Shetland lace (garden) fence on your walk back to the Meal Beach car park. The harbour of Hamnavoe is protected from Atlantic storms by the peninsula Fugla Ness; you can extend your walk by visiting the Fugla Ness Lighthouse! A trip to Sumburgh is always well worth making, in the summer to enjoy the seabirds, and in the winter to see the spectacular seas. There are a couple of options for dog walkers here – for a short walk, parking at the Sumburgh Head car park and walking up to the Lighthouse is recommended. For a longer walk we’d recommend parking at Jarlshof and following the coast uphill towards Sumburgh Head. There are stiles in place to help you cross walls; and please be wary of cliff edges! You’ll see Jarlshof, amazing cliff scenery, the lighthouse, Sumburgh airport and if you return via the road, we’d recommend a stop at Grutness Pier before returning to the Sumburgh Hotel and Jarlshof. A favourite in Lerwick, a walk to the Knab takes you to a rocky headland with fantastic views of the Sooth Mooth (the southern approach to Lerwick harbour). It’s a great place to see NorthLink ships sailing to and from Shetland, and there’s a WW2 lookout nearby and torpedo tube platform on the shore below! We’d recommend walking from Commercial Street, past the Lodberries (the fictional home of Detective Jimmy Perez), and along Twageos Road. You can either continue along the coast or head up Gressy Loan towards the Knab. Dog owners may be pleased to find bins at the Knab! Many folk continue the walk by taking the path beside the golf course down to Breiwick Road and beyond. Another great dog walk around Lerwick is around the beautiful Loch of Clickimin. There are a number of places to park nearby, either at the Clickimin Leisure Centre, Tesco or even on Westerloch Drive. Wherever you start from, the path around the Loch of Clickimin should take about 30 minutes for you and your dog to walk around, and gives lovely views of the town, including Clickimin Broch and Staney Hill. A small part of this circuit is near a busy road so don’t forget your dog’s lead! 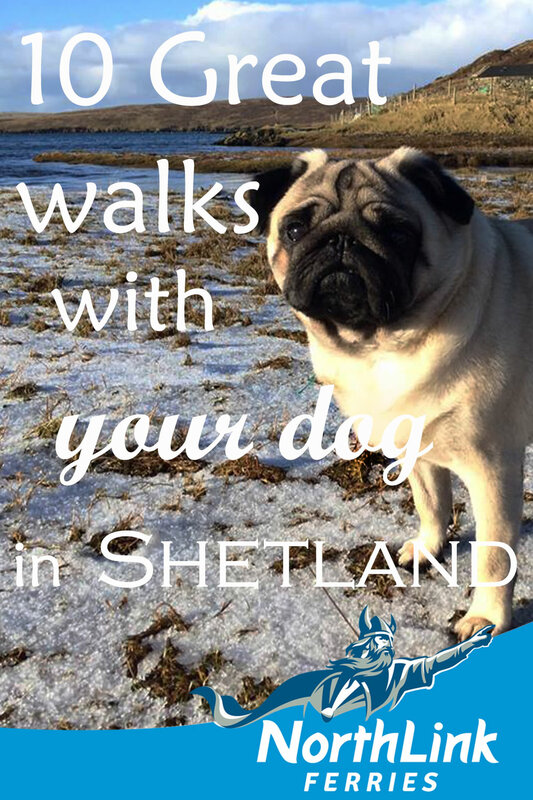 For a long Shetland walk that will please your pooch, we’d recommend heading to Northmavine and even further to North Roe and Fethaland. For dog walkers we’d recommend parking at Sandvoe Cemetery, walking along the beach and then taking the track to Fethaland; this is the best way to avoid walking through fields of cattle. Fethaland is best known for being a Haaf Fishing Station. Haaf fishing took place in the 19th century; fishermen would sail 40 miles out to the fishing grounds in large open rowing boats. The remains of the drystone lodges that the men slept in, and the pebble beach where fish was dried are still in evidence. As well as being a good 8 mile walk for you and your dog, Fethaland is a fascinating glimpse into the past! The island of Unst is the most northerly in the UK and we’d highly recommend a visit as there’s much to see and do, especially for those interested in Vikings. It is thought that Vikings first arrived in Shetland on this island. We recommend that you take your dog for a walk on Skaw Beach – it is Britain’s most northerly sandy beach! Access is via quite a steep and windy road, but there’s a place to park your car (next to Britain’s most northerly house!). There’s a bridge over a burn, however after a short walk you’ll find yourself on a dramatic beach with fine red sand and lots of interesting rocks to discover! In Northmavine, the area of Eshaness is littered with a series of dramatic volcanic cliffs, seastacks and geos. Amongst these is the island of Doreholm, which has a natural arch and resembles a Shetland pony drinking water. To get to a great vantage point to see Doreholm you need to walk and we’d bet your dog would enjoy coming along too! We’d recommend parking up at Stenness, which is a shingle beach and former Haaf fishing station. There are stiles over the fence and you’ll need to cross a low hillside to get the best view. For more adventurous dog walkers, there are circular routes round Eshaness, but this is a fine short walk with a great sight to see as a reward at the end. St Ninian’s Isle is a lovely place for dogs, children and adults; there’s a lovely long sandy tombolo (at 500m, the largest in the UK) which attaches St Ninian’s Isle to the mainland at Bigton. Medieval Treasure was found on St Ninian’s Isle in 1958. As you walk across to the island, waves wash in at either side of you, which is a very unusual sensation and creates symmetrical arching beaches! There is ample car parking and bins aplenty nearby. Visiting Shetland is a real treat for photographers; make sure you don't forget your camera when visiting! We hope you enjoy our 25 stunning pictures of Shetland's dramatic landscape, birds, ponies, Vikings, ancient monuments, cliffs and beaches! Up Helly Aa is the biggest of the fire festivals that take place in the winter months in Shetland. This Viking themed fire festival takes place in Lerwick on the last Tuesday of January. The day involves a series of marches and visitations and in the evening is the most famous part – the torch-lit procession and Galley burning. Find out more about the Shetland Fire Festival and view the webcast of 2019's event here! Shetland and Orkney have been populated for over 6000 years, and through the course of these Islands' history the languages spoken there have changed many times. However it is Old Norse that has had the greatest influence on modern place names. Read our guide to find out what the island, area and house names of Shetland mean!